Replacement air filter (10" x 10" x 1") for fan-forced convectors. 1971 requires 2 filters; 1910 and 1941 convectors require 1 filter. Replacement transformer for corner fan convector (part number 1910), wall mount fan convector (part number 1941), and 26K btu fan convector (part number 1971). Bolt on to the face of the heat exchanger to direct heat downward. Fits heat exchanger coil 106. Fan Blades are a component to construct a complete Suspended Space Heater (220k Btu). Will also require Heat Exchanger Coil (part number 111), Transition (part number 849), Motor Frame (part number 848) and Fan Motor (part number 1280). Each component sold separately. Some assembly required. Used as a component to construct a Suspended Space Heater (100k Btu). Will also require a Space Heater Fan (part number 322) and 100k Btu Heat Exchanger Coil (part number 106). Each sold separately. Some assembly required. Bolt on to the face of the heat exchanger to direct heat downward. Fits heat exchanger coil 108. Kit for Air Handler Cabinet part number 301 - back water access. 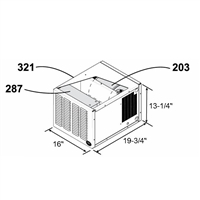 Note: This kit is only for modifying the Air Handler Cabinet (p/n 301) for back water access. This is not the Air Handler Cabinet itself. Kit for Air Handler Cabinet part number 303 - back water access. Note: This kit is only for modifying the Air Handler Cabinet (p/n 303) for back water access. This is not the Air Handler Cabinet itself. Transition Kit is a component to construct a complete Suspended Space Heater (220k Btu). Will also require Heat Exchanger Coil (part number 111), Motor Frame (part number 848), Fan Blades (part number 851) and Fan Motor (part number 1280). Each component sold separately. Some assembly required. Transition Plenum kit for making a 100k Btu Space Heater. Also requires Blower & Motor, 1/4-hp (part number 154) and Heat Exchanger Coil, 100k Btu (part number 106). Each sold separately. Some assembly required. Transition Plenum is a component for a Space Heater (140k Btu). 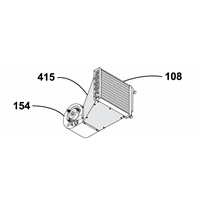 Also requires Blower & Motor, 1/4-hp (part number 154) and Heat Exchanger Coil, 140k Btu (part number 108), each sold separately. Some assembly required. Bolt on to the face of the heat exchanger to direct heat downward. Fits heat exchanger coil 111. Motor Frame is a component to construct a complete Suspended Space Heater (220k Btu). 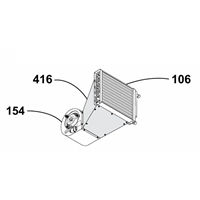 Will also require Heat Exchanger Coil (part number 111), Transition (part number 849), Fan Blades (part number 851) and Fan Motor (part number 1280). Each component sold separately. Some assembly required. Blower & Motor Assembly, 115 Volt, 1/15-hp. 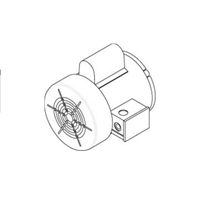 Used primarily for our 50K Btu space heater, is also used if a fan only is needed for the high output draft inducer (p/n 5549). Cabinet for housing 1/15-hp Blower & Motor (part number 203) and 50k Btu Heat Exchanger Coil (part number 287). Each sold separately. Some assembly required. Dimensions: 16" x 19-3/4" x 13-1/4"
Used as a component to construct a Suspended Space Heater (100k Btu). Will also require a Transition (part number 323) and 100k Btu Heat Exchanger Coil (part number 106). Each sold separately. Some assembly required. Fan Motor is a component to construct a complete Suspended Space Heater (220k Btu). Will also require Heat Exchanger Coil (part number 111), Transition (part number 849), Motor Frame (part number 848) and Fan Blades(part number 851). Each component sold separately. Some assembly required. Water-to-air heat exchanger coil with 90° 3/4" female pipe thread (FPT) outlets. Dimensions: 12-3/4" x 14" x 4-1/8". 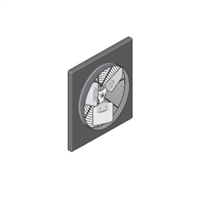 Replacement blower fan for corner fan convector (part number 1910) and wall mount fan convector (part number 1941). Water-to-air heat exchanger coil with straight 3/4" female pipe thread (FPT) outlets. Used in forced-air furnaces with plenum size of approximately 13" x 18". Dimensions: 12-3/4" x 18" x 4-1/8". Water-to-air heat exchanger coil with straight 3/4" female pipe thread (FPT) outlets. Used in forced-air furnaces with plenum size of approximately 17" x 18". Dimensions: 16-1/2" x 19" x 4-1/8". Water-to-air heat exchanger coil with straight 3/4" female pipe thread (FPT) outlets. Used in forced-air furnaces with plenum size of approximately 15" x 18". Dimensions: 15" x 20" x 4-1/8". 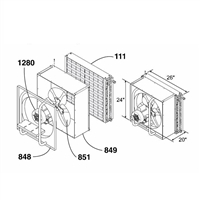 50k Btu fan coil unit (3/4" FIP) includes housing, fan, heat exchanger coil and louvers. Btu range: 20k-50k Btu. Approximate dimensions: 16-1/4" x 17" x 13-1/4". Motor: 70 watts. Myson Whispa™ III Kickspace 9000 fan-forced convector, output of 7,634-9,949 Btu/hr. Water-to-air heat exchanger coil with straight 3/4" female pipe thread (FPT) outlets. Used in forced-air furnaces with plenum size of approximately 18" x 18" to 18" x 20". Dimensions: 17-3/4" x 20" x 4-1/8". The heart of a forced air heating system, the Air Handler Cabinet is standard with front water access (refer to Technical Specifications for typical applications). For back water access, see p/n 3822. Water-to-air heat exchanger coil with 90° 3/4" female pipe thread (FPT) outlets. Used in forced-air furnaces with plenum size of approximately 18" x 18" to 18" x 20". Dimensions: 17-3/4" x 20" x 4-1/8". Water-to-air heat exchanger coil with straight 3/4" female pipe thread (FPT) outlets. Used in forced-air furnaces with plenum size of approximately 20" x 20". Dimensions: 19" x 21" x 4-1/8". The heart of a forced air heating system, the Air Handler Cabinet is standard with front water access (refer to Technical Specifications for typical applications). For back water access, see p/n 3825. Note: Blower & Motor (p/n 208 1-hp) and Heat Exchanger Coil (p/n 110 185K or p/n 111 220K) are sold separately. 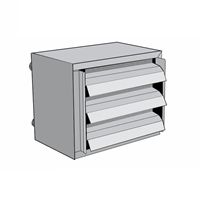 Air Handler Cabinet is capable of holding a filter (not included). Some assembly will be required. If utilizing an existing 24-volt thermostat to control blower, a Fan Center Relay (p/n 515) must be used.